McDonald’s has opened a new restaurant-museum in Italy that gives diners a view with a slightly macabre difference - beneath the fast food joint lies an ancient Roman road complete with the casts of three skeletons. The newly opened joint venture allows customers to order their usual Happy Meal while catching an incredible view of Ancient Rome through the restaurant’s glass floors. Situated in Frattocchie, Marino in the province of Rome, the bizarre restaurant lies along the route of the Appian Way, the ancient route that connected Rome to Brindisi, in Puglia. 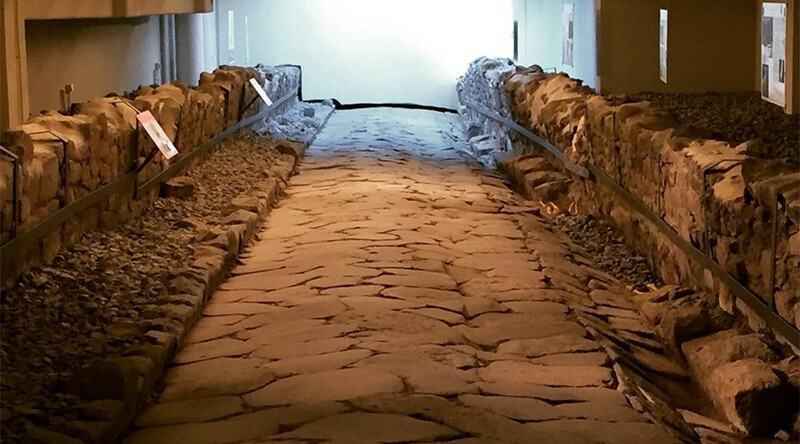 The discovery of the 45-meter-long highway, which dates back to between the second and first century BC, was made in 2014 when work started on the restaurant. McDonald's Italia funded the €300,000 restoration project under the supervision of Rome's Superintendency for Archaeology, Fine Arts and Landscape. During the excavation process archaeologists unearthed the skeletons of three adult males, believed to have been buried there after the road had already fallen out of use. Casts of the skeletons are exhibited on the road side which visitors can walk along for free. Wheel ruts of wagons were also found in the underground tunnel and are on display along the stretch of ancient road.